The First Annual Summer Beauty Festival opens on May 1st. Featuring 11 cosmetic designers, Summer Beauty will providehigh-quality and artistic makeup for your enjoyment! ✿ cheLLe ✿ Henna is a stunning Henna Face tattoo that comes in Olive and Red color. Included in this package is the left, right, and whole face tattoo for each color. You can layer these if you want to wear both colors at once! 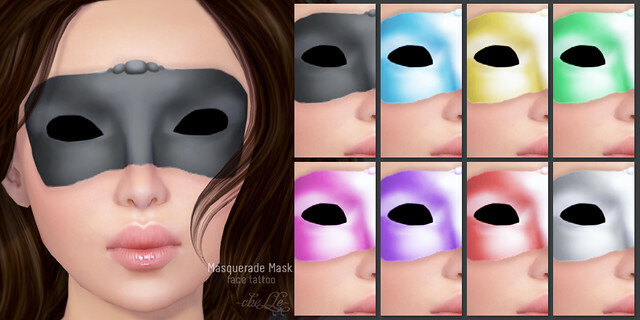 ✿ cheLLe ✿ Masquerade Mask comes in 8 colors and also includes Black Eyes for a ‘masked’ effect. You can wear these with your regular avatar eyes showing, or hide it completely by wearing the Black Eyes. I realy love the Henna Tatoo, and i m glad they are the real colors, and not black. I ll definitly get them, thank you for showing them here.